We all know that the Zombie Apocalypse is coming and the big question on everyone's mind is: what will you wear? 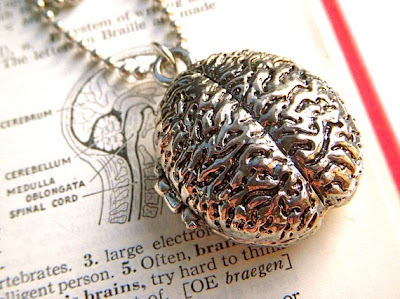 Fashionista zombie sympathizers might be sporting this trinket which just screams (and is) braaaaaaaaains. In addition to being the highlight of any good zombie Hallowe'en costume, I love the idea of this paired with a suit to keep the co-workers guessing. Especially when you consider: what goes inside: pictures of victims? I mean, what would your family think if you stored their mugs inside a silver brain... well, if they're anything like mine, they might just consider that pretty kewl.